An East Coast client landed a project with a top-tier insurance company, with potential for further work. Like many larger firms, email outreach/breakthrough was initially difficult, so in this case, direct mail (a currently uncluttered space) and phone outreach, backed by solid research from the RSW/US new business director to show our understanding, was critical. Project Work and In-House Agencies: Troubling Trends? Brighter Marketer Spending Forecasts: What Does It Mean for Agency New Business? The 2016 RSW/US New Year Outlook Survey reported the brightest outlook for Marketer spending in the 10-year history of the survey. 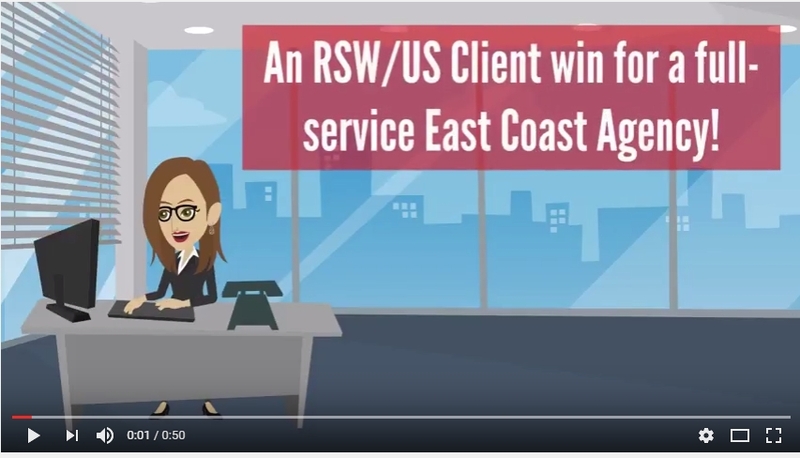 Still, agencies need to be aggressive to turn this forecast into new business, as emphasized in this video with RSW/US Owner and President, Mark Sneider. Blair Enns, Founder, Win Without Pitching: Are you affecting the buying process? It’s a jungle out there – so we’ve put together an infographic and video series on the 8 beastly traits your agency needs to survive the future. In this first video, we introduce the concept, the infographic and chart the course for the fun and informative entries to follow.